I sure know I am certainly not the only one disgustingly excited to watch Suzanne Collins book The Hunger Games adapted to the screen. As much as I was disappointed by the final book (sorry fans, but you know it’s true), I love when my favorite characters transform onto the big screen and I get to see my imagination take form. 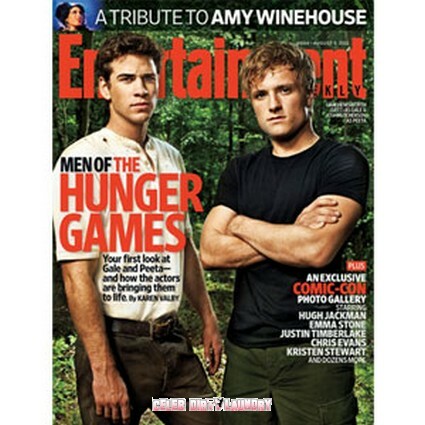 We got to see a glimpse of Jennifer Lawrence portraying Katniss Everdeen, and now Entertainment Weekly is showing us what hotties Josh Hutcherson and Liam Hemsworth will resemble while stepping into the shoes of their characters, Peeta and Gale (respectively). And boy, do they look delicious! For me, there’s nothing better than visualizing something I’ve been attached too, and I couldn’t be happier. I think Josh nails the look of Peeta (Liam does too, but I’m team Peeta through and through) – blonde hair and muscles suit him and make me craving for more!! I recommend fans of the series run out and get their copy right away when it hits the stands tomorrow. You can also count on me to keep you up to date with the entire goings on with production. March 2012 can’t come sooner!! !